Search engines take certain factors into consideration while deciding on the search ranking. Certain factors are more important than the others. 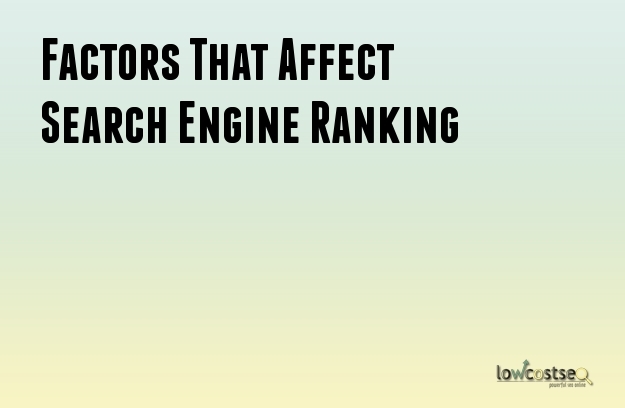 It is important that you understand which of them are a must have if you want a good search engine ranking. Some of the factors do not even have direct influence on the search results.If you have just launched your web site, here are certain tips for how you can ensure higher ranking for your site with SEO services UK. ·Placing the Keyword: Keyword plays a major role in the search ranking. If it is placed in the meta tags it will give a powerful relevancy signal. The keywords can also be placed in the description tag for good results. The keywords should also be placed in the content of the page. But, do not scatter your page with them as it can harm your web site in the long run. Updating your web site with fresh content on a regular basis will also work in your favor. You can also include the keyword in the URL slug for better results and ranking. Site Factors: There are certain site related factors like sitemap indexing, the type of domain being used, server locations, Webmaster tool integration, and mobile optimized sites and so on. The location of the server also plays a major role in deciding the ranking of the Web site. Off Page Factors: There are also certain off page factors that play a huge role in the ranking of search engine. The number of linking domains and the number of likings in the post. Some SEO experts believe that the links from the home pages have more weight and they can easily direct the search engine results. If you have too much diversity in the links used, the search engine can tag your web site as a spam website. ·Domain Factors: Your domain is a very important thing and it can affect your search engine ranking. The longer the domain registration is there the more trustworthy is the web site considered. The search engine, Google, considers the domains that have been registered for over a year to be most trustworthy as compared to those who are not. The history of your domain is also important. If your domain has a history of some illegal things or has been marked for penalty in the past, it can harm your site’s ranking. If you are aiming for the customers of a particular country, you should have the TLD extension for that particular place. This will ensure that you get a high ranking in the local search engines of the country. If you follow these certain points you will see a huge improvement in your ranking. The web site traffic to your site will increase and you will able to make more profits. Check if your monthly SEO package provider follows these rules. If they do you can be sure that good results will come your way in a matter of months.